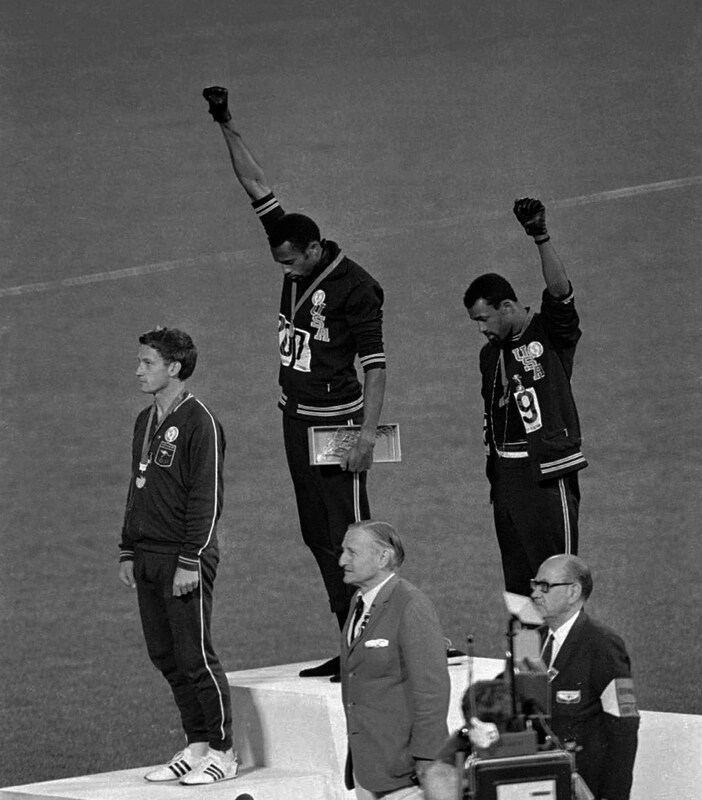 John Carlos was part of the most radical political moment in Olympic history. After winning the bronze medal in the 200-meter dash at the 1968 Mexico City Olympics, he and gold medalist Tommie Smith raisedz their black-gloved fists in an emphatic show of support for civil and human rights. For choosing to make a political statement on the Olympic stage, Carlos paid the price: he was ostracized and slandered for decades by the world of Olympic sports. It is difficult to think of a more appropriate person to discuss what athletes will be risking now by speaking out at the Sochi Games. Dave Zirin: Billie Jean King said in September that she wanted to see someone do a “John Carlos moment” at the 2014 Sochi Olympics. How does it make you feel to be associated with a moment where Billie Jean King can just say that and everyone knows what she means? John Carlos: Let me just say that Billie Jean King has always been one of my heroes in the world of sports, while on the court and even more so off the court. For her to acknowledge me for my deeds in life, to parallel what she’s been doing in life, is just a marvelous thing. For anyone to text you or to call you, or just see you in the street and tell you, “I read a wonderful quote from Billie Jean King in USA Today, and she said in Sochi they need a John Carlos moment”—you know, it just doesn’t get any better than that. It shows you that people are paying attention, are realizing that we’re in this fight together. DZ: Speaking of that fight, Sochi is coming up. Based on your experience, what does an Olympic athlete risk by speaking out? JC: They’re going to risk condemnation. They’re going to ridicule him in the early stages, until society wakes up and realizes that the individual is right and had a right to speak out for the issues that concern his life as well as so many others. DZ: Now, the International Olympic Committee in your day was of course headed by Avery Brundage, a ruthless man. Today it’s much more of a corporate money-making operation. By your observation, is the IOC today more ruthless or less ruthless than it was in 1968? JC: Well, I don’t think it’s more or less; I think they just see green. And I think that green has superseded the moral fabric of the Olympic Games. You know, what it stood for back in the days of [modern Olympics founder] Pierre de Coubertin relative to where it is today—they’re way off base. DZ: Let’s say that one of these winter athletes gave you a phone call and said, “I want to speak out; I’m not sure. I’m worried that it will deflect attention away from the other athletes, and I’m worried that I’ll get in trouble.” What would you say to that athlete? JC: Well, I wouldn’t be concerned about the other athletes; I’d be concerned about what’s right. I don’t think the fact that you make a statement will affect any of their performances or put a shadow on them. I think that you need to follow your conscience, follow your heart and follow your wisdom, your education as to what the plight is. DZ: What would you say if an athlete asked you if you had any regrets about what you did in 1968? JC: None whatsoever. If I had to stand tomorrow, I would stand tomorrow. I’d be getting ready tonight for tomorrow. DZ: You would be right there. You would have no regrets whatsoever? JC: Without a doubt. The only regret you have is that you didn’t have a whole bunch of people around you standing out doing the same thing. You know, that’s what made me stand out: it’s because so many others chose to take the low road as opposed to the high road. DZ: Now, one of the concerns that people have about speaking out in Sochi is not just the IOC but also the Russian government itself. Did you have any concerns in Mexico City about whether the Mexican government would crack down on you? JC: Well, there’s always a possibility, but at the same time there’s world condemnation. You know, leaders of other parts of the world don’t necessarily agree with what’s happening in Russia with their laws. And if there was a crackdown on various individuals, then it becomes a venue for the world to speak and let Mr. Putin know how they feel. Someone has to be the sacrificial lamb. But that doesn’t mean that you have to sacrifice all—it just means that you have to take a small step backward to take many giant steps forward. DZ: Let me ask you this: How does it make you feel to have someone like Billie Jean King and all of these athletes—they’re white, brown, black; they’re either part of the LGBT community or they have friends or family members who are LGBT—and they see you as an inspiration. How does that feel? JC: Well, it makes me feel good. You know, we can’t put labels or tags on one another. All we can say is that we’re just human beings. And we should try to remember, regardless of what your ethnic background is, or what your sexual preference is, or what type of food you like, it doesn’t matter. It just matters that we all have the right to be who we are in this society. And we need to keep fighting to make sure that there’s an even playing field for all people that are being oppressed.